A Medic's Guide to Essential Legal Matters offers practitioners highly practical advice on the legal principles which they need to apply to everyday clinical practice. Thirteen chapters cover key areas of medical law from the structure of the legal system, confidentiality, mental health capacity, through to current legal practices. Each chapter is written in an easy-to-digest format with helpful summary boxes covering key legal terms, laws, and statutes, and 'key point' boxes highlighting important take-home facts. An alphabetical glossary of legal terms at the end of the book offers a rapid reference that supports every chapter. A Medic's Guide to Essential Legal Matters has been carefully crafted to be concise yet informative and practical, covering the key aspects of this daunting subject. Written by a team of doctors and legal practitioners in the field of medical law, this resource offers you the expertise and experience needed to get to grips with medical law. 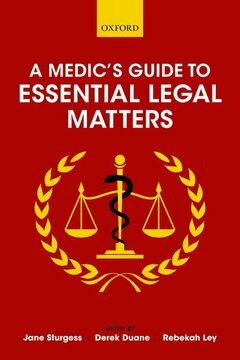 A Medic's Guide to Essential Legal Matters includes access to online-only content, consisting of 65 multiple choice questions and answers that can be used to reinforce understanding, along with further reading sources to supplement and explore topics of interest. You can access and use this online material by activating your unique access code.